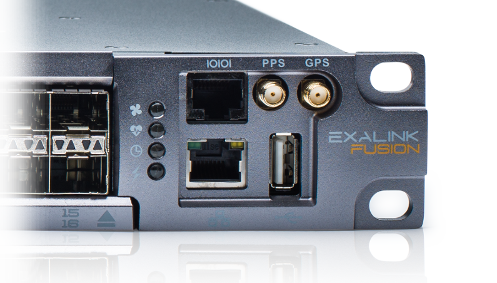 We're proud to announce that as of today, all ExaLINK Fusion switches will ship with inbuilt GPS functionality. This is provided at no extra cost to customers, and allows you to perform very accurate time synchronisation between multiple geographic sites. All that's needed is to connect up a GPS antenna to SMA port marked GPS. GPS antennas are now available in many datacenters. Customers can also take advantage of the GPS functionality to generate PPS timing outputs for other devices in their system. For example, the ExaNIC can perform hardware timestamping and includes a PPS input that can be daisy chained. This allows all of the ExaNICs in your system to share a very accurate common synchronised timebase. This update to the Fusion platform is part of our continual commitment to provide the best possible product to customers, and a result of listening to their valued feedback.